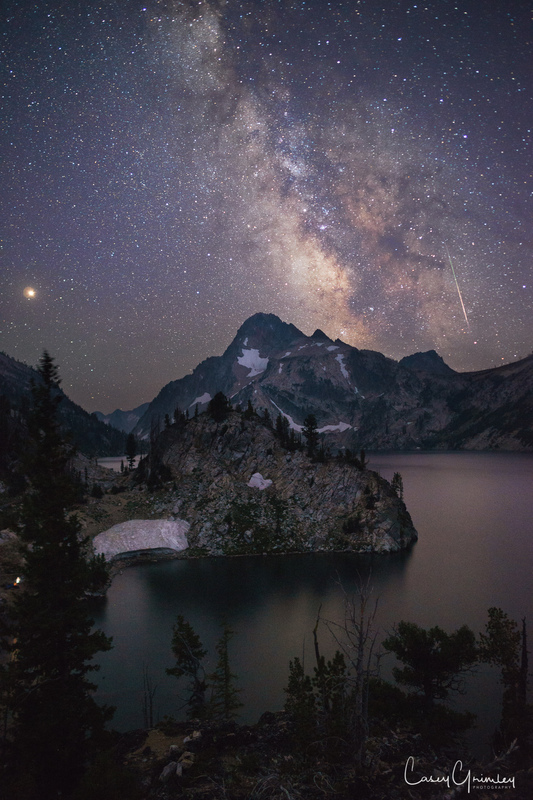 My favorite meteor photo from the Perseids as seen at Sawtooth Lake, Idaho. Scott Jarvie (@jarvie) and Brandy went out scouting for sunset locations while I was napping....No wait, that's not how it went (unless Scott was telling the story) it was I who went out scouting while Scott and Brandy were napping, and I found this really cool spot that gave us a great view to the milky way to the south and a great view to the north where the meteors were supposed to be, with a body of water on both sides. They seemed to be pretty content with the location we were at, that was until they went to this new spot, that I found, and had a look around. After shooting some sunset photos, there was a moment where we kind of knew that we were going to be moving camp and we all agreed, This is the place. With just a few hours until showtime and quickly fading light, we broke down camp with no attention to organization of how we threw our stuff in our packs, and then set it all back up at our new found spot. As the stars came out two other photographers, Eric Benedetti and Andy J, joined us and we shared stories of scary animal encounters, talked nerdy camera talk, and oohed and aahed at the meteors falling from the firmament above, cheering when we'd capture one, and cursing when we didn't. After a few hours we all seemed content with setting up cameras for time lapse and heading to bed. After getting my 3 cameras set up, I laid in my clear mesh tent and did my best to keep my eyes attentive for more meteors. I failed, and failed hard. I did, however, wake up a couple times to check on my cameras and change batteries. A very magical photography @caseygrimley! Unfortunately we live in a big city with much light pollution. This will be very difficult 😬 to take a good picture like you. Great picture i love that you got the whole inlet and that meteor is well balanced with mars. Daggum dude, this is so pretty! Great spot. Resteemed! About 90? That's quite alot! The view is fascinating! I'm just excited that we had some clear skies among the wildfires here in the West. This photo looks unreal it is so beautiful!! !great work. @caseygrimley The location of this meteor shower looks perfect for the photograph! The mountains and the sky are absolutely beautiful and the meteor that I can see is so impressive with the capture. I love seeing night shots because it is something I have never been good at. I have attempted once and failed miserably. Again, very beautiful shot and location! Now that is a naughty astro shot! I'm a naughty astro photographer. Beautiful shot Casey; we missed it up here socked in with smoke.